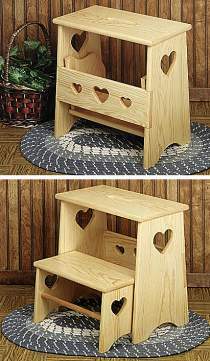 Step stool folds for easy storage in the corner of your kitchen or bathroom. Let’s you reach those high kitchen cupboards. Just the right boost little ones need to wash their hands and brush their teeth. Plans drawn FULL SIZE. Measures 17-1/2"W x 11"D x 17-1/2"H.